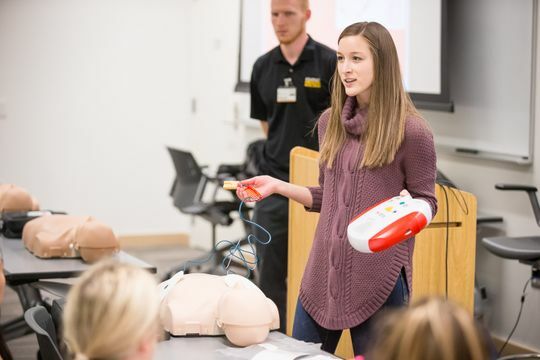 UI senior Morgan Zuidema exhibits automated external defibrillator (AED) operations on a practice dummy to a classroom of UI students at the UI Campus Recreation & Wellness Center. About 30 students gathered in a meeting room at the University of Iowa Campus Recreation & Wellness Center on Monday, Oct. 29, practicing CPR breaths and compressions. Most didn't know it, but they were part of an effort to help the University of Iowa meet the standards required to be certified as a HeartSafe Campus by the National Collegiate Emergency Medical Services Association. If and when a cardiac arrest happens on campus, UI officials want to make sure there are sufficient CPR-trained people and defibrillators in close proximity to improve survival odds. "I make it a habit in new places, looking to see where they are," said pediatric cardiologist Dr. Dianne Atkins about automated external defibrillators (AED). Atkins has been working on the Richard Kerber HeartSafe Initiative since last summer with Dr. Richard Kerber's wife, Linda Kerber. Linda launched the program in honor of her husband shortly after his passing. He died Nov. 8, 2016, after treating patients at UIHC and contributing to cardiac arrest response for more than 45 years. If at least 5 percent of the UI campus becomes trained in CPR, installs AEDs in more buildings and improves signage, it could be the first campus in the state to receive a HesrtSafe certification. UI officials think they're pretty close, or have possibly exceeded the requirements. Atkins said they'll submit an application in February and find out if they are certified at the Medical Services Association conference next year.